Restaurant patrons and reviewers alike often use the term “atmosphere,” and indeed, it’s a vital part of their experience. An artful menu and reliable service are much of what makes a fine restaurant, but they must be accompanied by a well-chosen setting in order to differentiate the business and boost profitability. The foundation of the atmosphere you build rests on restaurant interior design. Like designing an inviting home or a fine meal, the work of a professional commercial interior designer will take into account every facet of the customer experience, and shape it to encourage and complement the enjoyment of your cuisine. This is the core of your differentiation. Logos, displays, color palettes, and décor should all reflect the unique identity and message of your restaurant. Service efficiency and customer comfort alike depend on your layout’s functionality. Consideration must be given to kitchen and restroom access, other high traffic areas, seating capacity, serving logistics, and more in order to maximize the potential and the comfort of the space. In sushi restaurants, sandwich shops, and more, the kitchen may be partially or fully visible to customers. Any kitchen, however, should be designed consistently with your restaurant’s message, and be an efficient, ergonomic, and attractive space. Easy counter and front-end accessibility will minimize delays and streamline productivity. Other considerations include making storage space unobtrusive yet accessible, as well as lighting and ventilation. 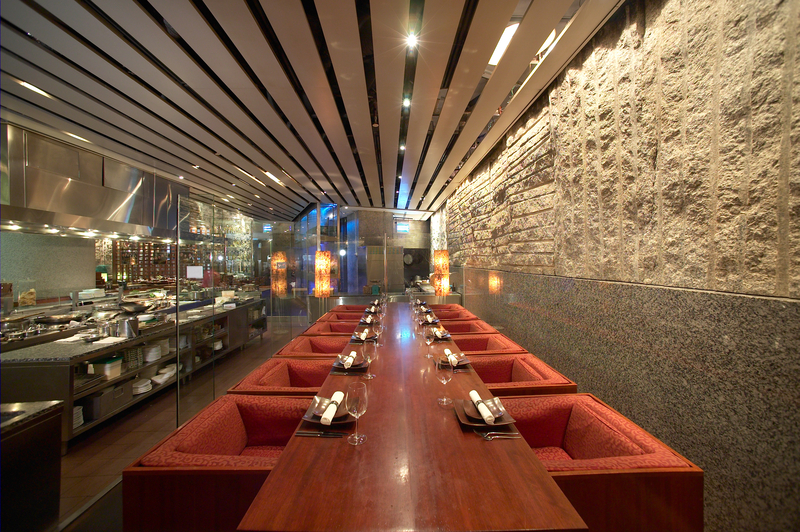 Your lighting, seats, and tables greatly influence the dining experience. These must be harmonious with each other and congruous with your customers’ expectations. An affordable, friendly diner that invites in breakfasting commuters might employ large windows for sunlight and small tables for many small parties, but a high-end restaurant serving mainly dinner would be better suited to low lighting and comfortable booths for intimacy. Restaurants are a customer-centric business, and virtually all need repeat patronage to succeed. You must develop your restaurant’s distinct personality and character so its appeal ranges beyond staples like good service, cleanliness, and the artful but short-lived experience of your food. A professional interior designer, with experience in commercial design, is the best resource for helping you plan and execute your welcoming – and profitable – restaurant atmosphere. When you’re ready to achieve exceptional restaurant interior design, contact Viridis Design Studio at (303) 489-9958 for the best professional commercial design in Denver, Colorado.